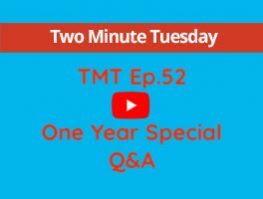 That's right..... One year of TMT is celebrated this week with a Q&A episode with questions sent in by our clients and answered by myself in the beautiful city of Seville. 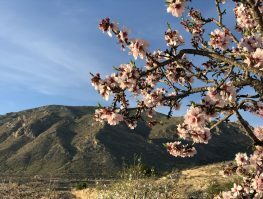 This week we look at Spanish Wills. Something that we hope you will not need for many years to come, however it is something that you may not be aware could be one of the most important documents you will need. We look at the importance of having the will prepared, how you get one, who prepares it and where you need to go....... and if you already have a will..... are you sure that it is legally recognised in Spain. This is an important episode for buyers, sellers and residents alike. In this weeks Episode of Two Minute Tuesday we look at Off Plan Properties. It may sound daunting building your own home in Spain, however what better than designing your dream home from the ground up with your specification, you set the budget and choose the location. This video with give you the basics and should you decide you wish to progress further you at least have the facts from which to make your decision. With a budget of 200.000€+ your dream home may soon be a reality. In this weeks episode 49 of Two Minute Tuesday with Hondon Valley Homes we answer a conundrum faced by many clients when looking for their dream home in the sun...... Exactly how many villas should I view before making up my mind. TMT Ep.48 How to Buy a Villa RECAP. This week we take a review of all the pertinent episodes of Two Minute Tuesday that will assist a potential buyer in Spain. Rather than searching through the 50 episodes of TMT so far this weeks episode will point you in the right direction for the episodes that you need. This week we look at driving in Spain. Many clients are worried when the come to Spain about driving rules and regulations as well as driving a car with the wheel on the left and driving on the right hand side of the road. We have even been asked which way do you go around the roundabouts??? Find out much more on this weeks episode. TMT Ep.46 The Padron - What, Where, Why and How? Following on from our episode on RESIDENCIA and last weeks episode on FISCAL RESIDENCY we now turn our attention to the PADRON. What is it, why do you need it and how do you go about getting it? Watch this weeks episode to stay fully informed. TMT Ep.42 Do you Need a Lawyer to Buy a Villa in Spain ? 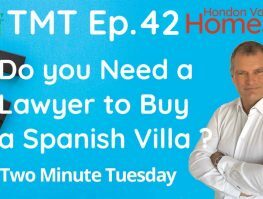 In this weeks episode of Two Minute Tuesday with Hondon Valley Homes we look at if you need a lawyer to buy a property here in Spain. Amazingly one client we spoke to recently took the decision to purchase many years ago without using a lawyer. Was this a good idea, did saving a few euros pay dividends in the long run....... ?